Discussion in 'Amps/Cabs Tech Corner: Amplifier, Cab & Speakers' started by puddlefish, May 1, 2016. I hope this is the correct forum,my apologies if not. I can supply a quality 12.5 x 8 x 2.5 beefy unmolested aluminum chassis that will fit 4 power tubes,1rectifier tube and 3 preamp tubes for a stereo 5e3 style amp(bright channel only). I also have a beefy stereo PT from this amp that is perfect http://audiophool.com/Schem_A/S-C_ASR-120_schem.gif as well as all tubes needed.I can discuss in more detail with prospective builders. Just floating the idea,I'm surprised nobody builds an all tube pedal board amp yet,the advantages are real appealing to probably tons of guitarists and the makers almost non existent. The board would be pretty heavy. Like just putting your head on the floor in front of you. And you would still have at least one long speaker cable run. J M Fahey likes this. It would be heavy yes but no more heavy than the AC30cch I currently use,without the benefit of stereo operation. Also I'd rather run 20ft of speaker cable than guitar cable and incur high end loss-no post fx buffer needed at here. To set up my complex/huge sounding *stereo* rig up all I have to do is to connect a single power cale into a single outlet,plug one guitar cable in,connect 2 speaker cables(which I may just attached to the lightweight pine speaker cabs and with coil thumbs on back like an appliance)and I'm off playing-instead of farting around with conventioanl set up.For those running a single ampboard amp it's even lighter and less work. Thanks but I like my idea no less. It'll be at least 7 inches taller than the point on the board that it's attached to, probably taller. You'd probably need a cage of some kind over the tubes, or they'd be trashed in no time. Sounds like a straightforward build, but you'd need to be sure you could live with the form factor. Two 5E3's is enough power and clean headroom? Just batting it around in CAD, that looks like a pretty tight fit in that chassis for what you're talking about. The PT I have came off this chassis that is 13x8.5,slightly bigger but more than large enough for the 3 transformers and 7 tubes that will populate it. There's also plenty of room for 2 speaker jacks,2 input jacks and 5 knobs/pots (2 volume and tone plus a power scaling knob)The 2-Hammond 1750e's are the same dimensions as the the 2 pictured here,with cage it will l be 7 inches tall and it will be fabulous. Also the cage itself could be used to mount connectors and controls,there's many possibilities.The PT is 4 inches excatly,tubes are shorter to 2.5 in + 4.5 in still gives .5in clearance for a total of 7 inches.A more shallow chassis could be built even lower. Also imagine some amp maker doing this AND adding some 9-18V pedal power supply...would be real attractive to ALLOT of guitar players,especially working guitarists.A single amp would be even easier. Did I mention less exposure to sound vibration on the tubes from the speakers? (granted barring a punk/thrash scenario)Whether the pedal switching would be less jarring I can only speculate but I think so. here's the same Carlson.stromberg done up on Ebay,again plenty of room for everything I mentioned.I couldn't upload the underneath shot but there's lots of room to work with. ..sorry for getting ahead of myself,I think a sizable chunk of players would opt for such an amp and i want the first one! You could get a Dynaco 50w stereo amp. It's about that size, sounds great. You'd need to build a preamp for each side, but a nice Ethos style "warm, clean" one should be small and simple. It usually takes a little larger one though . FWIW, as a widely known (in Argentina) custom builder I get bombarded by proposals about "new - improved stuff which will certainly sell a lot"
I seldom say straight "no" ... if it's physically possible that is , but: "ok, maybe it'll be cool, get 2 other friends/customers interested in it and when I have the 3 down payments in my account, I'll start doing it". Now if a very enthusiastic guy can't convince just two more about his idea , I mean "voting with their wallets" , not with their tongues, the future does not look bright for that concept. * 30/60/100/200W battery powered Bass and PA combos, with built in battery. * acoustic piano amplifier, embedded inside an empty vertical piano case, nothing showing, for a symphonic player who "was not allowed to use electronics"
and on and on and on ... yet I would hesitate on building what you are asking for ... would rather use a buffered line (which will have way less loss than a long speaker cable run, by the way) and feed a speaker side amp, tubed if you wish. besides, just imagine when (not if, Murphy's Law is the only one which is always right) some flat footed dumb/drunk/stoned guy trips on your speaker cable and unplugs it from either end. Doubt the OT will like that. DaveKS, xtian, pdf64 and 2 others like this. However that may work with hermetically sealed compact amplifier with switched power supply and class D power stage, at least that's where my imagination took me. Designing and building stuff can be fun but expensive and a lot of trial and error (unless standards are low). J M Fahey and pdf64 like this. That response is appreciated,but I am undeterred .I DO appreciate the insight though(there were some good ideas in there that according to you went nowhere).You probably wouldn't be shocked to learn that there's plenty more ideas where that one came from.They call it ADD these days. As it stands I came home from work and had received an email from a local builder who seems onto the idea of building one,not as a line of amps but one just for me..onward. As for abuse I plan to fortify that thing-I didn't reveal ALL my ideas,and it won't be exposed to much more than my AC30CC sporting beer rings.What fun would it be if it weren't dangerous? Thought about that,there's an 80's or 90's Peavey stereo el84 amp for sale at a local Musicgoround.I decided I wanted the whole thing as one unit with my hammer tone finish and saggy power section. Good to see somebody doesn't think I'm off my rocker.Woulda been cool if you pulled the trigger-I woulda bought one. As you will have to make a cover no matter what chassis you use, why not just use the one that the transformer(s) came on? Once all of your cutting and drilling is done, have it sandblasted and then chromed, powder coated, or shoot it with a rattle can of VHT paint and bake it in the oven (when the wife isn't home). Isn't this sort of thing why they build racks? Didn't Mesa, Peavey and Marshall all cover this territory back a few decades ago? OF course, those stereo amps and all of the associated EQ's, effects, etc were rack mounted instead of being a big package sitting in the middle of the floor ready to be tripped on, but???? Same thing....just out of the way. I think I will be going with the existing chassis,a bit bigger than I wanted but an easy grab and allot less work. ..haha,no racks for me,give me a lump of pedals and amp. And I haven't heard an active pickup I want(I like my fuzz too,the two don't play so well),with my lump of gear I won't be needing any buffer either- another benefit. 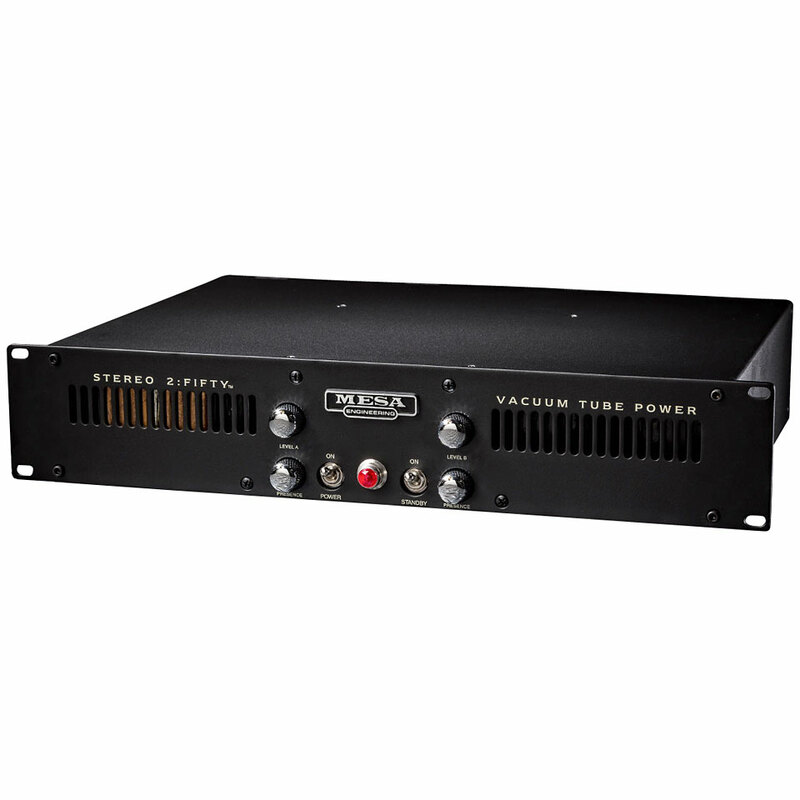 Not sure if this has been touched on but what about a preamp on or near your pedalboard, then a stereo power amp mounted in the speaker cab? For example, I have a single-space rack unit Lee Jackson stereo power amp I'm not using, seem's like that would be a good candidate. Then run something like a Bogner preamp pedal on your board. Either find a stereo preamp or run a mono pre into stereo effects (pedals, I guess) then on to the power amp.